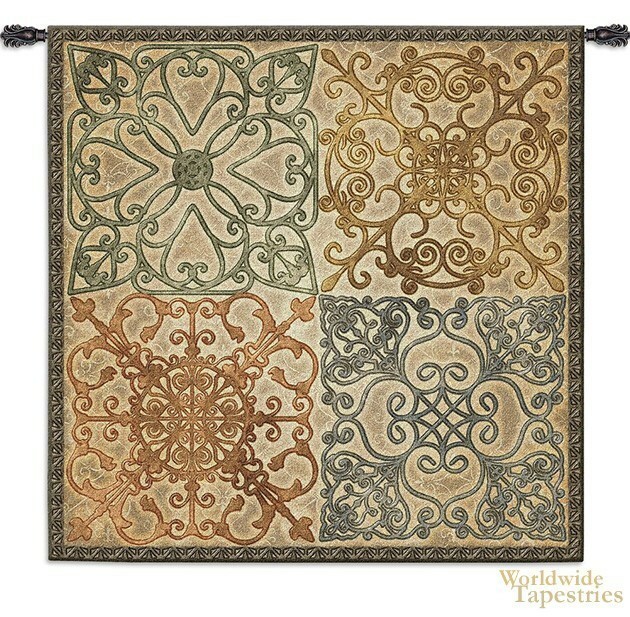 This modern tapestry "Wrought Iron Elegance" shows a design inspired by wrought iron decorations by contemporary artist Simpson. Wrought iron has been used since the 15th century for structure and decoration, and has a wood grain effect when bent and wrought into shape to give its unique look. Here we see a design inspired by wrought iron which is balanced in terms of its use of color with the green and blues, and browns and reds complementing each other, as does each of the four designs which are different yet complimentary. This contemporary tapestry "Wrought Iron Elegance" is backed with a lining and has a tunnel for easy hanging. Note: tapestry rod and tassels, where pictured, are purchased separately.